If you enjoy exploring abandoned places then this is the road trip for you. 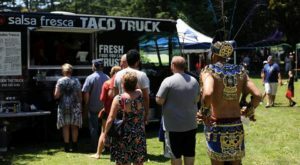 From a forgotten zoo to a lost village, this trip highlights some of the state’s long forgotten spots. Take a peek into history like never before but be warned, some of these locales are rumored to be haunted too! 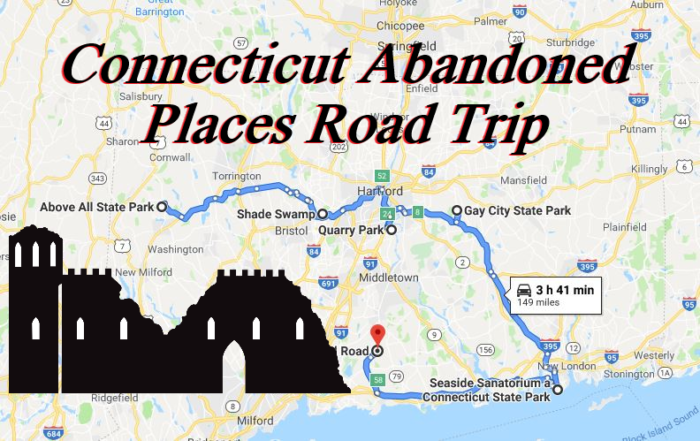 Are you ready to get started on the Connecticut Abandoned Places Road Trip? You can grab the map for this fascinating road trip here. 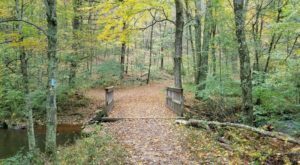 Some of these locations require hiking so make sure you wear hiking boots or sneakers. Remember to respect any no trespassing signs and stick to the marked trails. 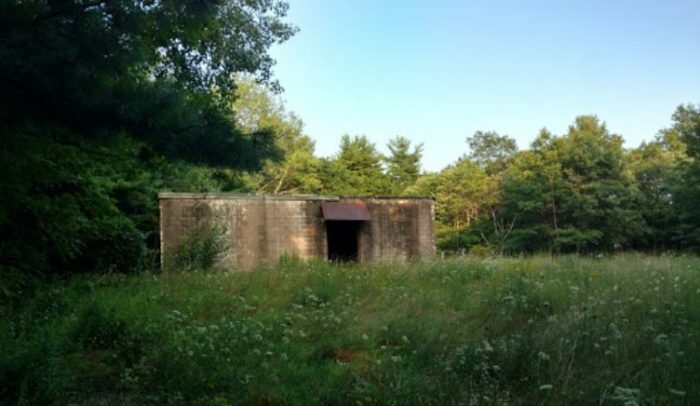 Above All State Park is an undeveloped walk-in park that houses the remains of a Cold War-era military radar installation. The state park originated in 1927 but from June 1957 to June 1968 was used as a ground defense station. It was an unmanned radar station for those 11 years as part of the Semi-Automatic Ground Environment (SAGE) Air Defense Network. Now the abandoned building, footings for the tower, and supports for the generator are all that remain. Many pass by this historic shelter on the roadside of Route 6 in Farmington without a second glance. 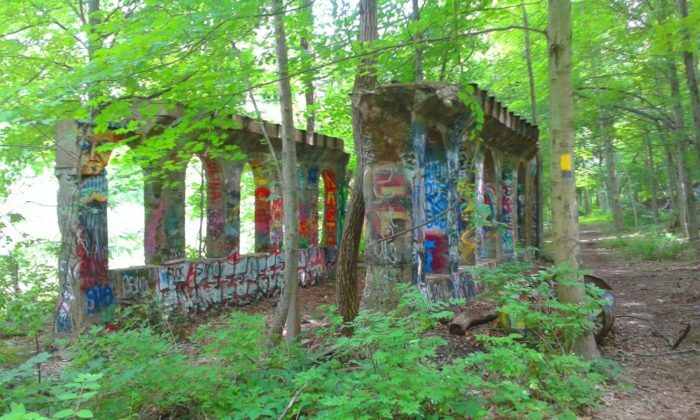 Take the trails past this building and discover the abandoned zoo in the woods beyond. 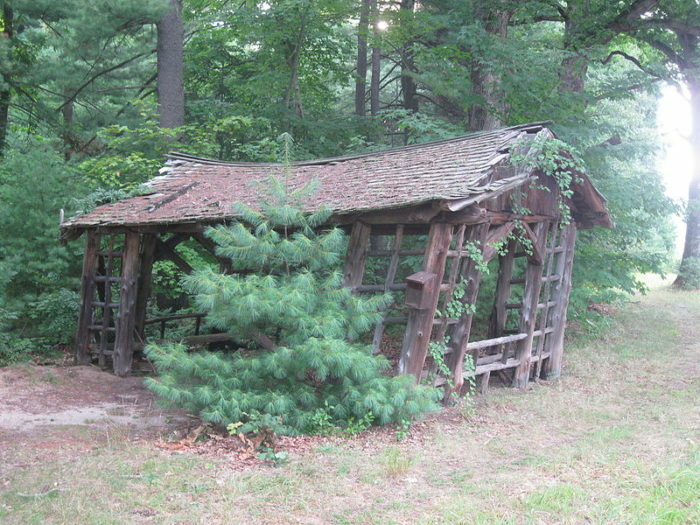 The Shade Swamp Sanctuary was opened in 1934 and abandoned in the 1960s. The sanctuary rehabilitated injured animals but is also rumored to have performed experiments on animals as well. A 5-minute hike from the road will take you to the creepy remains of the zoo where metal cages are being reclaimed by nature. Learn more about Shade Swamp Sanctuary here. Quarry Park lies on the former site of a trap rock quarry in Rocky Hill. The rock quarry was worked from the late 1800s to mid-1900s. The floor of the former operation is on several levels with the tallest rock face jutting 60 feet above the ground. At one end of the quarry, you'll discover the ruins of the operation being overtaken by the forest. Bright graffiti covers almost every possible surface making the stone easy to distinguish from its surroundings. A hike here gives a glimpse into this abandoned industrial site. Factory Hollow was a once thriving mill town established in 1796. It's mills were devasted by multiple fires and by the end of the Civil War, the village was abandoned. The town was renamed Gay City when the land was sold to the state in 1943. 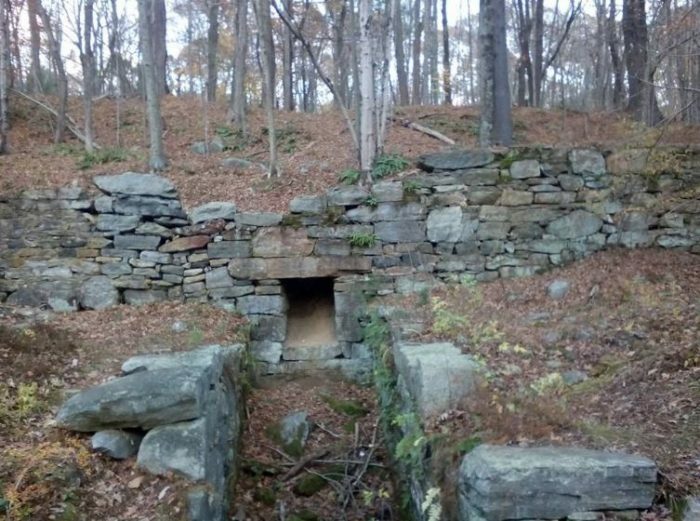 The ruins of the town are now within Gay City State Park and you can hike the trails to explore what has been left behind. Find out the full story of Factory Hollow here. 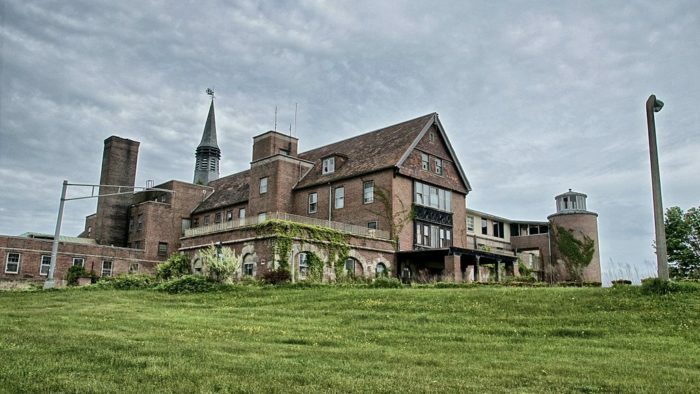 The Seaside Sanitorium was built originally in the 1930s to treat children with tuberculosis. In 1958, the shoreline medical facility was repurposed for treating elderly patients and then later those who were mentally challenged. By the early 1970s, it was reported that many of these patients were being violently abused by their caretakers. In the 1990s, the death rate of the patients was alarmingly high. The sanatorium was abandoned and closed in 1996. 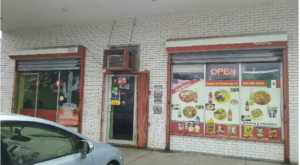 Paranormal investigators have gone to the site coming up with different results but many believe the site is haunted by residents that met untimely deaths here. 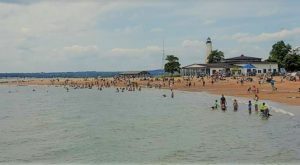 The land is now owned by the state of Connecticut with a proposal to turn it into a state park. You can visit the grounds but may not go inside the sanitorium itself. 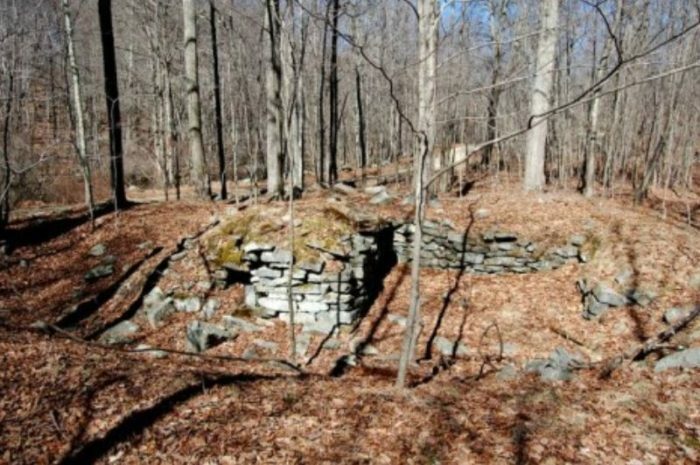 Located on Regional Water Authority property in Guilford, is the remains of a Colonial-era settlement. A group of families was making their way towards Genesee Valley in New York. The story goes that as they were traveling, a wagon wheel broke. Instead of fixing the wheel and continuing on, the families stayed and settled the land. By the 1850s the settlement had been abandoned. Whether the families moved onto more fertile land for farming or something different happened, no one seems to know. You can hike onto the RWA land to see the stone remains of the settlement, there is a fee required for hiking the property. Do you have any brave friends to take with you on this Abandoned Places Road Trip? If you aren’t afraid of ghosts, you’ll also enjoy the story of this haunted lighthouse in Connecticut.